My usual cycle camping buddies (Travis Poppe and Dan Lloyd) and I were eager to do an overnighter soon, and Labor Day weekend was approaching. Recently, Jeff Selfa had joined our circle of geeky beer drinking cycling folks and Travis had gotten himself a girlfriend, Justina, and they both wanted to come along as well. Jeff is a very experienced cyclist and has the ability to blow us all out of the water in terms of speed and skill as well as sheer coolness factor of the bicycles that he rides, so I thought he was going to be bored to tears for this event. Justina is pretty new to cycling so I was worried that this 60 mile round trip ride was going to make her hate cycling for the rest of her life. Ah, well, I was interested to see how things were going to turn out! And you never really know how a cycle camp is going to go anyway, to be honest. But that’s how adventures are supposed to be and I wouldn’t have it any other way! We all gathered at Travis’ house at around 9:00 am on Saturday, September 1. It was a sunny day and the temperature felt perfect. 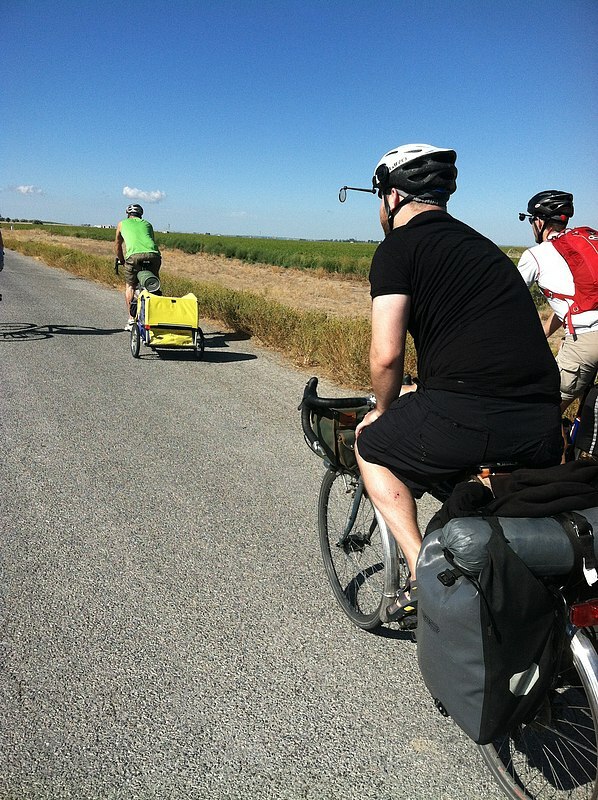 Dan and I were towing trailers, Jeff and Travis had their panniers packed, and Justina carried a bottle of water. ;-) Yes, we knew what Justina was in for, so we thought we’d better assist her the best we could. She seemed very happy and enthusiastic about the ride; I hoped this would carry her through when things got tough for her ahead! After we ate, we picked up some food and beer at a local grocery store and cycled the remaining 5 miles or so to Pipeline Road. Jeff and Travis decided to cycle down the dirt road to see how crowded it was since many locals love to have one final camp for the year over Labor Day weekend. After a while, Jeff cycled back to us and announced “we’ll have to share the campground… with the birds!” The campground was completely empty! We all cycled down to the campground, had a look around, cracked open a few beers, and relaxed. The lush greenery, massive Snake River, pelicans floating by, and the surprising absence of bugs made this area seem like such a paradise. Next, we set up our tents, made a fire, drank more beer, and started cooking some food. 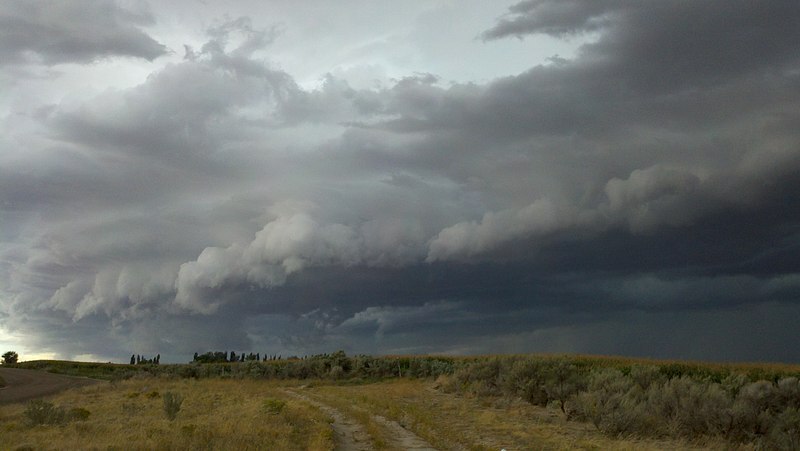 Shortly thereafter, dark clouds started coming in, the wind began to pick up, and a few sprinkles began to fall. Dan shot a video of it! The rain started getting a bit harder, but I just stood there like an idiot, shirtless, drinking beer and enjoying myself. The temperature hadn’t fallen much and I have a layer of blubber that keeps me warmer than other people, I think. Dan and Jeff put on their rain jackets and Justina turned herself into a burrito with a sleeping bag. Next, the wind and rain started falling way too hard for comfort, so I dove into my tent! I was sure to take some beer with me, though. I’m an expert at outdoor survival, I’m sure you can tell. The rain stopped after about 30 minutes or so, so I emerged from my tent and went back to the campfire. Jeff and Dan had apparently weathered the storm by standing around the campfire with their jacket hoods cinched up. We cooked more food, ate plenty (mostly thanks to Jeff and Dan’s instant add-boiling-water meals) and took some lovely shots of the sun setting across the Snake River. And then we headed to our tents for bed. And it was at this point that poor Jeff discovered that his bivy sack and sleeping bag were completely soaked. He decided his best choice was to cycle home through the night. Dan volunteered to go with him since drivers probably aren’t used to seeing cyclists pedaling along the back roads in the middle of the night. I loaned Jeff my headlight blinker and he and Dan pedaled off into the night. Jeff wrote a brief but vividly written article entitled "The Pipeline Deserter Branch – s24o Labor Day 2012" about his experience that night. Tis a good read! 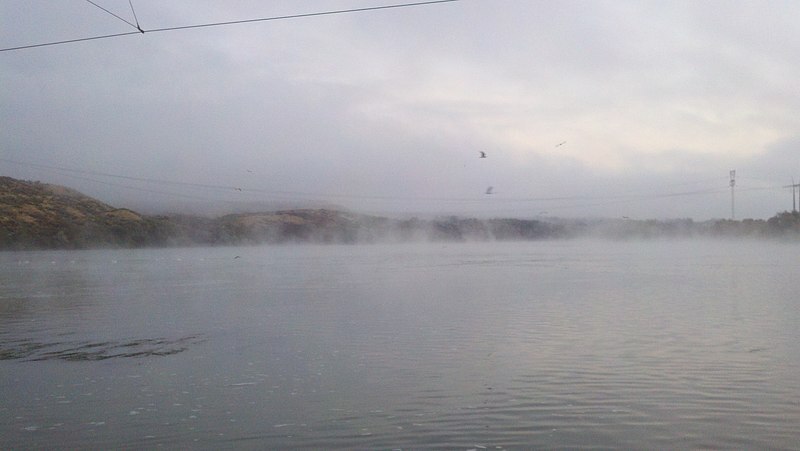 The next morning, thick fog rolled in and mist was coming off of the river. It looked like like an enchanted scene from a fantasy movie. 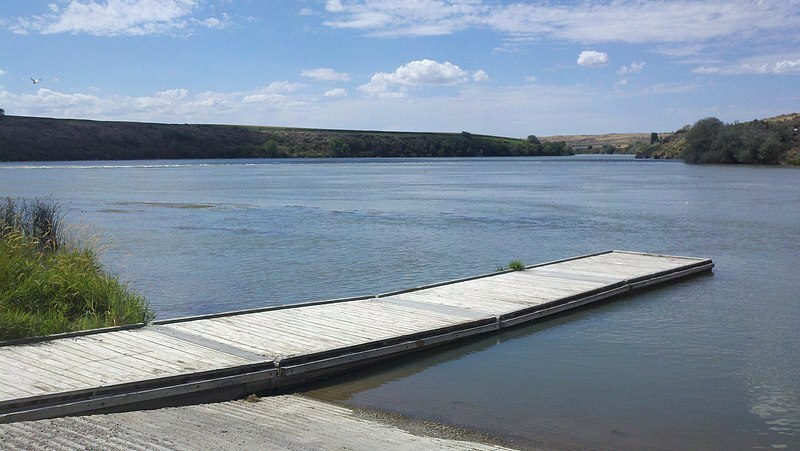 I walked out onto the dock and basked in the sounds of fish jumping and water birds talking to each other. As soon as Travis and Justina were up, we cleaned up the camp site, packed up, and headed back towards American Falls. There, we stopped at a cozy diner called Casey’s Lounge, ate a hearty breakfast with plenty of hot coffee, and then headed back to Pocatello. Hot coffee and breakfast is so fantastic and delicious after camping overnight, isn’t it? The ride home was pleasant except for the fact that we were all tired of sitting on a bicycle saddle. And the temperature had risen a lot, so by the time we were nearing Pocatello, I was ready for a long shower and more beer! And that’s exactly how I ended my journey. Oh, and Justina endured this whole trip like a real trooper! She did amazingly well for her first long bike ride as well as being surrounded by beer swilling barbarians for 2 days straight and we’re all very proud of her! Here's a link to all the photos we took!